Place desired amount of dumplings into a saucepan and cover with plenty of cold and lightly salted water (1g salt per 1L water). Allow to rehydrate for 3 minutes (when using an induction stove). Bring water to a boil, cover the pot and cook dumplings for approximately 8 minutes. Take out the dumplings and briefly rinse under cold water. Tear open carefully and serve dumplings hot. Store in a cool and dry place. Consume within 4 weeks after opening. Bread chunks 81% (WHEAT FLOUR, salt, yeast), sunflower oil, corn starch, HEN'S WHOLE EGG POWDER, salt, onion powder, parsley, spices. May contain traces of celery and soy. 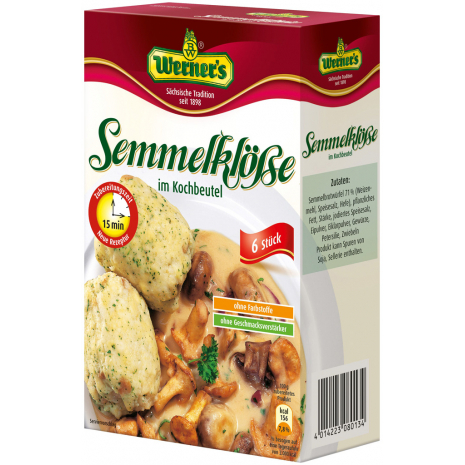 Semmelbrotwürfel 81% (WEIZENMEHL, Speisesalz, Hefe), Sonnenblumenöl, Maisstärke, HÜHNERVOLLEIPULVER, Speisesalz, Zwiebelpulver, Petersilie, Gewürze.